Figure of the equipment needed follows this list. 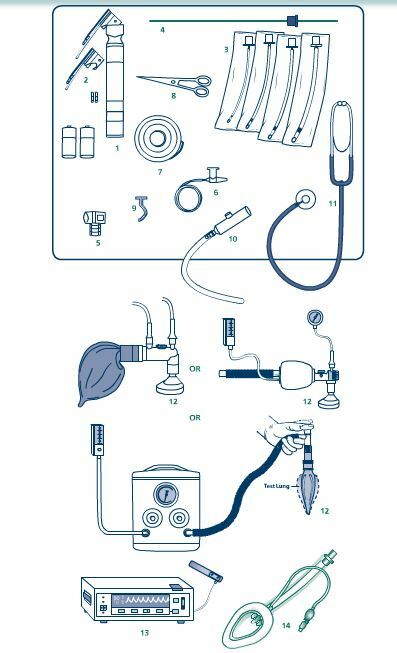 Laryngoscope with an extra set of batteries and extra bulbs. Blades: No. 1 (term newborn), No. 0 (preterm newborn), No. 00 (optional for extremely preterm). Straight rather than curved blades are preferred. Endotracheal tubes with inside diameters of 2.5 [wt < 1,000 g; Below 28 wks], 3.0 [wt 1,000 – 2,000 g; 28 – 34 wks], 3.5 [wt 2,000 – 3,000 g; 34 -38 wks], and 3.5 – 4.0 [wt > 3,000 g; > 38 wks]. Stylet (optional) that fits into the endotracheal tubes. Carbon dioxide (CO2) monitor or detector. Roll of water proof tape (1/2 or 3/4 inch), or endotracheal tube securing device. Positive pressure device ( bag or T-piece resuscitator) and tubing for delivering air and/or supplemental oxygen. Self inflating bag should have an oxygen reservoir and all types of devices should have a pressure manometer. Pulse oximeter and neonatal probe. Laryngeal mask airway (size 1) with 5-mL syringe. * Textbook of Neonatal Resuscitation, 6th ed. 2011, American Academy of Pediatrics and American Heart Association. This entry was posted in Airway Management, Neonatal Resuscitation, Neonatology, Pediatrics. Bookmark the permalink.